Read a letter from Andrew Greene to Jim Foster of the Peacebuilding Institute, telling about himself. 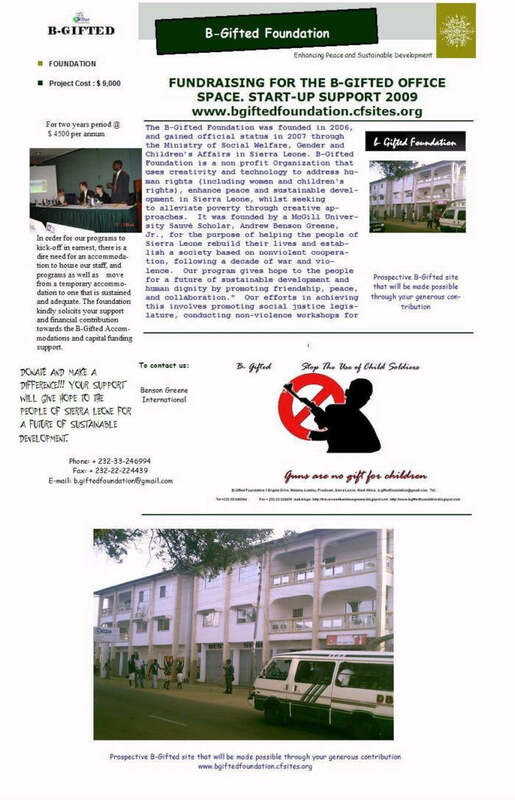 The B-Gifted Foundation was founded by a McGill University Sauv� Scholar, Andrew Benson Greene, Jr., for the purpose of helping the people of Sierra Leone rebuild their lives and establish a society based on nonviolent cooperation, following a decade of war and violence. Our program gives hope to the people for a future of sustainable development and human dignity by promoting friendship, peace, and collaboration. Our efforts in achieving this involve promoting social justice legislation, conducting non-violence workshops for people in Sierra Leone and other countries, organizing peace clubs in Schools, engaging women and young people in technology for global interaction and education, creativity and arts that foster peace, human rights and social justice. "CONTRIBUTE GENEROUSLY TO BUILDING PEACE IN POST CONFLICT SIERRA LEONE"
Sierra Leone is found on the west coast of Africa. It's recent history has been one of turmoil, civil war, and finally, an uncertain peace. Shortly after independence from the British in 1961, a series of military coups created great instability. In 1991, competing rebel forces launched attacks that terrorized the nation, these efforts being largely fueled through illicit diamond trade. This civil war lasted nearly 10 years and resulted in widespread atrocities, namely, the maiming and mutilation of thousands of innocent civilians and the conscription of young people into the army. These youths, torn from their homes and forced to commit horrible acts under great duress, effectively became Sierra Leone's lost generation. When peace was finally achieved in 2001, these youths were left without families, direction, or hope. Peace education and human rights awareness raising is essential to help redress the past. 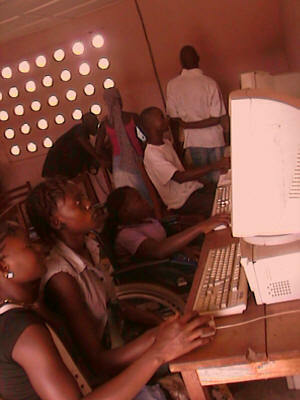 The youth beneficiaries served by B-Gifted Sierra Leone are still nursing the wounds from the aftermath of the war. Some were child soldier conscripts who now are in great need of social, emotional, and practical skills. Others grew up in a hostile, war-torn environment, knowing only poverty, fear, and destitution. Still others languish in the diamond mines, forgoing education for a life of toil. All of these young girls, boys, and children, are the future that Sierra Leone has to depend on, and B-Gifted SL is committed to preparing this generation for its responsibilities in the years to come. The Artist in Residence for Human Rights (AIR4HR) is one of B-Gifted Foundations unique upcoming programs that brings new insight into the field of human rights and democracy in Sierra Leone through arts in residency and residency through arts that is made possible through the eyes of human rights artist. The AIR4HR also seeks and demands from the selected artists to bring a unique perspective in the field of human rights and the values of peace, human rights and democracy must therefore be the subject of their work and at the core of their thinking as they go through the three months residency to create messages that not just foster human rights values, but also bring hope, to people whose rights have been violated, and unearth the present, past human rights abuses, or seeks unique and thought provoking ways to curb human rights abuses, through these artistic genres: literature (poetry, play writing, drama, prose and short stories), photography, music, filming, art work comprising drawing paintings and cartons, craft work, and graphic arts. B-Gifted Foundation is looking for a few dedicated students who would like to make a difference in the world by working with us in Sierra Leone. Below is an application form to be completed in its entirety. Contact us for more detailed information at info.bgiftedfoundation@gmail.com.